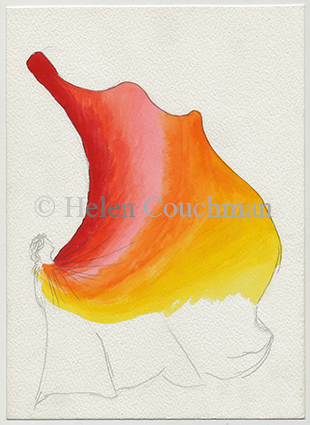 Helen COUCHMAN moved to London in 1991, where she completed a BA in Fine Art at Sir John Cass in 1996, and an MA in Critical Fine Art Practice at Central St Martins in 1998. She was more recently invited to pursue a period of post graduate research at Chelsea. Couchman has exhibited widely, both in the United Kingdom and internationally, often producing new bodies of work during residencies. Amongst these are Cyprus (2003), Vermont (2005), China (2006), London (2015) and Taiwan(2015). Moving to live in Beijing in early 2007, Couchman published her first book there, WORKERS , in June 2008. Portraits from the series have been exhibited in London (2008), Hong Kong (2008) and Beijing (2012). Couchman’s second book, Mrs West’s Hats, was published in November 2009. 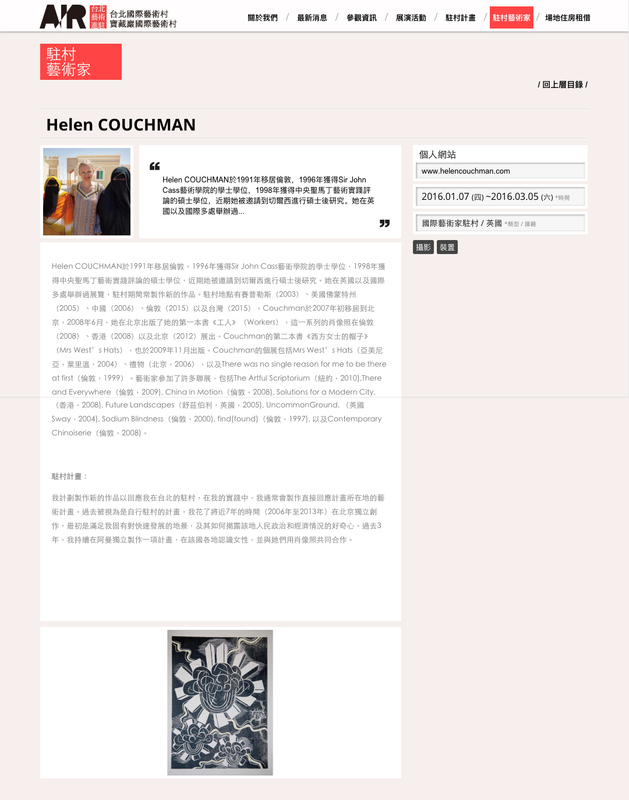 Couchman’s solo exhibitions also include Mrs West’s Hats, Yerevan, Armenia (2004) Gift, Beijing (2006) and There was no single reason for me to be there at first, London (1999). The artist has contributed to a number of group exhibitions, including The Artful Scriptorium, New York, (2010),There and Everywhere, London (2009), China in Motion, London (2008), Solutions for a Modern City, Hong Kong (2008), Future Landscapes, Shewsbury, UK (2005), Uncommon Ground, Sway, UK (2004), Sodium Blindness, London (2000), find(found),London (1997), and Contemporary Chinoiserie, London (2008). 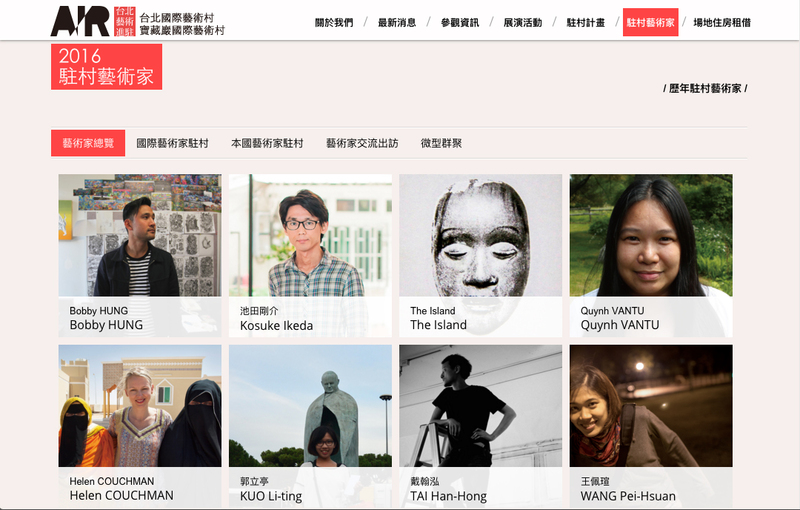 I plan to make new work in response to my stay in Taipei. In my practice I often make art projects in direct response to the location I work in. In the past they have been referred to as self-made residencies. I spent nearly seven years, 2006-2013, working independently in Beijing initially as it fulfilled a persistent curiosity I have regarding fast changing landscapes and how they reveal the politics and economics of the people in those places. In the last three years I have been working independently on a project in Oman making expeditions across the country to meet women and collaborate with them on portraits. Drawings have been added to the website. Further drawings will be added one by one in time. Follow these links.